My son got big fast, and at seven months had already outgrown any rear-facing car seats. As was our custom at the time, we were pretty well broke. That’s one of those expenses you can’t just ignore, though, right? I went looking for a good forward-facing car seat – and by “good” I actually mean “the cheapest thing on the shelf that still looks safe.” I lucked out; they had just cleared out the displays in the baby department at the local Wal-Mart – including car seats – and were selling the old stock at a discounted price. The result: I purchased this $40 seat for $20. The major factor that pushed me to buy this seat – apart from the price, obviously – is the fact that the seat doesn’t have a very large base. By the time we purchased this seat, my 1998 Ford Taurus had long since gone kaput. We had to be able to find something that would fit on the narrow bench seats in the back of our extended cab 1994 Ford F-150 (two door). This seat fit…barely. If it had been even slightly larger, it would have been nearly impossible to even get it into the back seat. The Cosco Touriva has no detachable base. I have never used it rear-facing, though the base does adjust to different angles for both rear and front facing. By the time I purchased this one my son was just too big to face the rear – his legs curled up against the seat with his knees firmly planted in his chest. For forward-facing, all you have to do to install is run a seatbelt through the hole in the back and hook it on the other side. For shoulder/lap belt combos, pull the belt all the way out until it ratchets and then pull it snug. Lap belts that adjust manually just need to be pulled as tight as possible to ensure the seat isn’t going anywhere. The harness hooks in two different slots in the seat and has a plastic piece that hooks at armpit level – not quite as secure as a 5-point harness, but still pretty good. 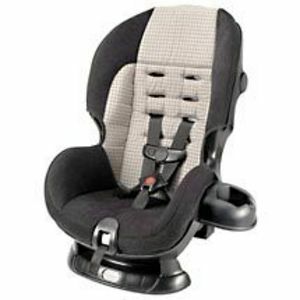 Push a grey button on the front of the seat in order to loosen the harness to get the child in and out, then pull the strap above the grey button to tighten it and make sure the kid can’t wiggle free. So far my son has figured out how to work the plastic piece at armpit level, but luckily can’t figure out the other buckles yet. When the harness is properly tightened, he can’t get even that piece undone anyway. There are several sets of slots on the back of the seat for adjusting to different heights. Use the slots closest to your child’s shoulder height (or just above). There is a metal clip on the backside of the seat where straps easily slide in and out to move them to new slots. Frankly, the setup for harness adjustment is the only thing I wholeheartedly like about this entire seat. Personally, I would much prefer to have a seat with a detachable base so I wouldn’t have to twist around to get the seat hooked in each and every time, but I can’t complain too loudly for the price. No doubt, this wouldn’t be quite as much of an issue for people with sedans, vans or SUVs – or, at very least, a four-door pickup. An extended cab was never designed to be the primary transportation for young children. As for construction, the seat seems to be fairly sturdy. It’s a little cheaper-built than most seats, but still looks like it’d hold up well in the event of a crash. I can’t say if it actually does survive crashes, though – thankfully, I’ve never yet even hit a deer with my kids in the vehicle, much less anything more severe. The seat cover has a very thin foam pad underneath it and that is it. It’s just fine for running errands around town, but my son has expressed his discomfort – very loudly – when he’s stuck in the seat for longer road trips. Living in Wyoming, it’s extremely common to take 2-hour drives or longer. With this seat, I start feeling guilty at about 20 minutes when he hasn’t had a break from it. Several elastic loops hold the cover in place, making it easy to remove for cleaning. Despite the cover’s light gray color, we haven’t had any problem with staining – it’s somewhat slick and made of synthetic fibers, so most messes just wipe off. The seat is good up to 40 pounds, which means that we were in the market for a new seat again just before my son’s second birthday. Most other people would probably get more use out of the seat, as average two-year-olds tend to be somewhat smaller – in fact, my younger son didn’t hit 40 pounds until a little after his third birthday, but he got a much more comfortable Safety 1st Alpha Omega Elite convertible car seat after the less-than-stellar experiences with the Touriva. Overall, I’ve been reasonably satisfied with this seat. I’m sure I couldn’t do any better for the price (especially since mine was half price!) and it served us well for almost eighteen months. If you’re on a budget and don’t travel very far very often, especially if you have a small vehicle, then this is a good seat.